← The Upside Down jellyfish…. Mushroom Cap jelly found in the Chesapeake Bay.. 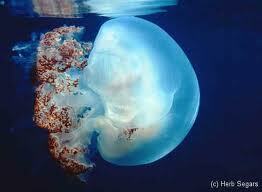 In the autumn months, the Mushroom Cap jellyfish, Rhopilema verrilli, may enter the Chesapeake Bay. It has a deep swimming bell without tentacles and is creamy white with darker markings on the sturdy central tentacle structures. Mild to no sting.. This entry was posted in 5% acetic acid/Vinegar on jelly stings, Box jellyfish, Cannonball jellyfish, florida-jellyfish-portuguese-man-of-war-florida-beaches-long-island-beaches-hawaii-waikki-oahu-guam-austalia-stingersmauve-jellyfis-pelagia-nortiluca-black-sea-nettles-stingrays-sport-fi, Irukandji, jellyfish, jellyfish species, jellyfish sting first aid, Jellyfish sting remedy, jellyfish stings, Jellyfish stings, vinegar, acetic acid, Lion's mane jellyfish, Man of War, marine sting first aids, marine stings, mushroom cap jellyfish, Pacifici coast sea nettles, Pelagia Nortiluca, sea nettles, StingMate, Uncategorized, Vinegar on Jellyfish stings. Bookmark the permalink.